My month in pics – August 2012 - Do You Speak Gossip?Do You Speak Gossip? Another month comes to an end and takes with it our precious summer! Although summer in Greece is far from over, I can’t hide the fact that I get a little bit depressed every time this happens. It’s not that I love summer, no! I actually hate the scorching heat that goes with it…I’m a spring girl at heart. That’s my favorite season. But when summer is over, it means that we’re going into fall and then winter (my least favorite season). I can’t help it but feel depressed by this change, when nature changes again, and we can see nothing but fallen leaves (which I admit can be very romantic) and naked trees, and most important of all, the time changes again! This time change from summer to winter is what depress me the most, when the days become shorter, and the nights longer… When the darkness comes at 5pm instead of 8.30-9.30 p.m that does in summer… Oh summer time I’ll miss you the most! At least we have almost 2 more months until the time change! 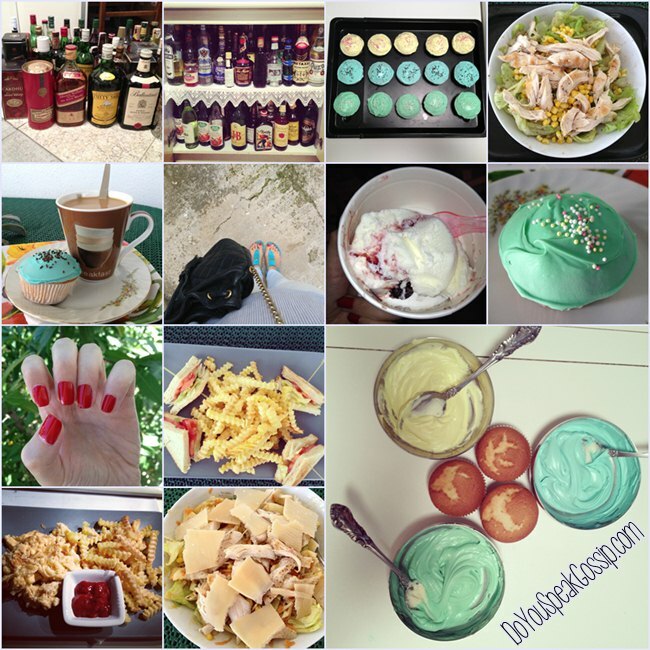 Blue mint, Chalkidiki Diary, Colorblock this!, Miss Robin Hood, Mom’s Birthday party, Summer Sunsets, Bare midriffs and Greek colors. 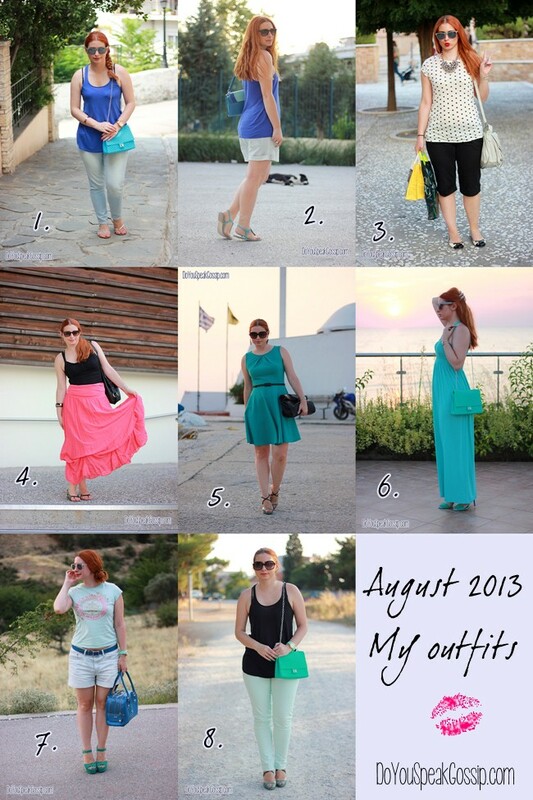 These are the 7 outfits I shared with you in August! You can click on the post’s names above to be directed to the original posts, in case you’ve missed anything. August was also a great month for my Shoe Challenge by Shoeperwoman.com. I managed to save 11 pairs! I’m now at Shoe Save #25 on my shoe Challenge, which means that I have 35 more pairs to finish it, since I just hit 60 pairs on my Shoe Collection, with the latest addition to it. August was a good month too, as shopping goes, ‘cause I took advantage of the sales to add some new items to my closet: Apart from the shoes, I added a Céline luggage look-alike tote and a Zara peplum top, and some beautiful statement necklaces (and bracelets) from Zara and H&M. Don’t have anything else to share for now, since August was pretty much a boring month. At least I had the Shoe Challenge to keep me going, and organizing outfits in my mind always fixes my mood. This, and going for a swim at nearby beaches…. See you all in my next post, which is as usual a wishlist of the next month. Don’t forget to follow me to get my latest updates. Lovely month! Well, you know how much I like floral prints, so I loved that strapless dress you were in Chios and the dress your sister-in-law gave to you! As favorite shoes, I would say I loved numbers 16, 19, 20, 21 and 23 – yes, the trainers/sneakers are included! Believe it or not, I am now a big flat shoes’ lover, it happened! Of course I still love heels, noooo doubt, but I started appreciating flats too! I know what you mean about summer/winter/spring… I love winter, BUT not what you mentioned, either – the days getting shorter and shorter… but I can’t wait to be in the UK, wearing the lovely coats I left there and boots, boots, boots! I’ll go in 5 weeks! Very happy! I hope you have a great weekend and that you show us lovely outfits, like you did now! You are lovely and very beautiful! Very glad to know you! Thank you Denise! The pairs you choose – except for the sneakers – are my favorites as well! I rarely wear sneakers, I don’t like them very much, but they are comfortable. Xereis poso ou aresoun ola!b Alla ta papoutsia sou einai fantastika!! Makari na ta diplassiaseis! so-st-yle recently posted..Keep it simple! lots of blue and i love it. Your August looks are all great. Love them!!! I know exactly what you mean! This summer was soooo hot, and the temperatures were kept high for so long. I’m not ready for fall fashion yet, but I’m sure I will when the temperatures allow it. Kai emena me pianei mia melagxolia tin teleytaia mera tou Aygoustou! Isws einai ypoleima twn paidikwn xronwn mias kai to telos tou Augoustou simaine oti se liges meres arxize i sxoliki xronia. Oson afora sta rouxa twra kai o Augoustos eixe megalo endiaferon. Polles wraies protaseis kai yperoxa papoutsia na tis synodeyoun. Ante kalo mas mina me polla outfit post kai nees idees gia na antalassoyme! Isws etsi na einai…exeis dikio! S’euxaristw para poli! Kalo mina kai se sena glikia mou Elsa! Ah, I’m definitely going to miss summer as well. I can agree with you completely on the point that it’s not because of the season itself. I hate the heat more than anything! I’d choose shivering over sweating any day. Those are some awesome summer outfits and shoes! My goodness, I am quite inspired by your fashion. That green dress with the perfectly matching shoes is too cute. (Fourth outfit, top right). Thank you sooo much! You picked my favorite outfit too, of the month. Glad you like it! You look amazing in dresses!! So feminine and gorgeous! 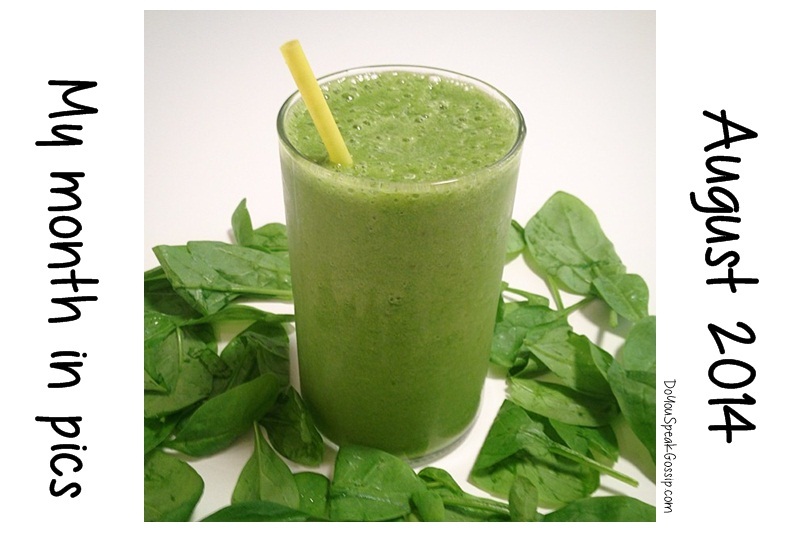 Mint and all green-ish, blue-ish tones are absolutely fantatsic on you! Thank you Ramona! I’m glad because I love greenish and blueish tones. And it seems I wore a lot of them this month. Βλεπω το mint colour σε πρωτη προτιμηση! nai nai, to mint kai genika ta prasina kai ta mple! Can’t believe it’s already September. 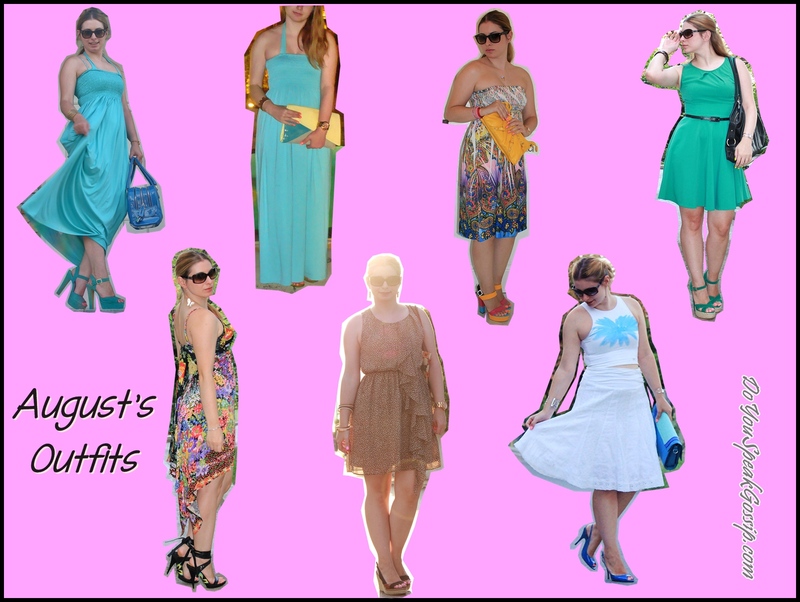 Love your dresses! It’s always nice to see your monthly recaps. You’ve had a busy August! 🙂 I always feel the same when Summer is over, because it’s the same for me I’m not the biggest fan of Winter so right now it’s Spring and I’m getting more excited about Summer!! If there was a way to spend 6 months here and 6 months where you are it would be perfect, haha. Thank you! Oh that would be perfect! I should start searching for tickets to Australia really soon! hehe I love Spring so much!!!! And I’ll come back to Greece in April. hehe Wish I could afford it. Pingback: September’s wishlist | Do You Speak Gossip?